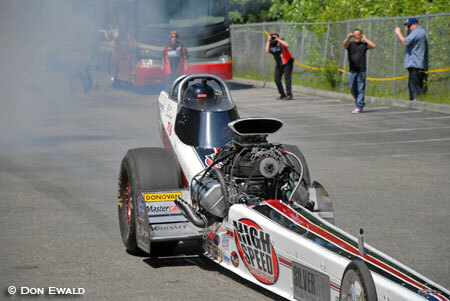 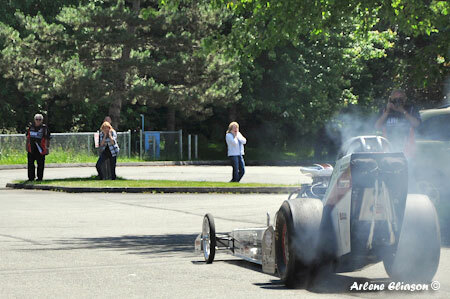 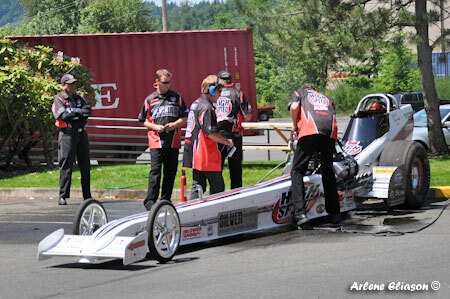 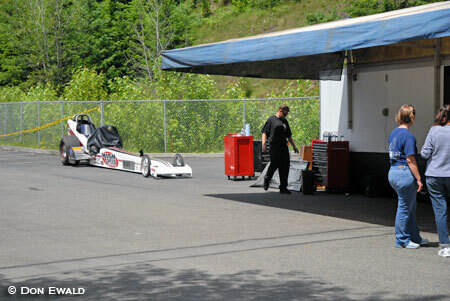 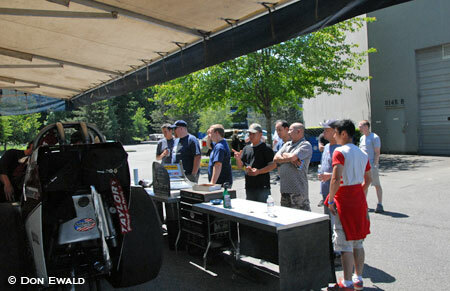 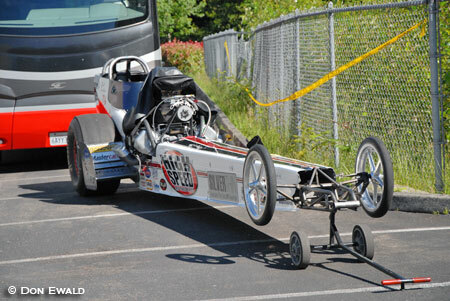 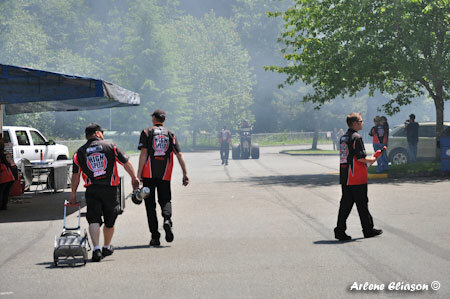 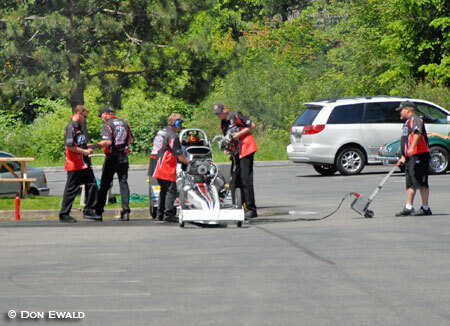 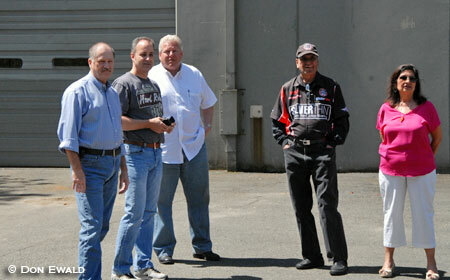 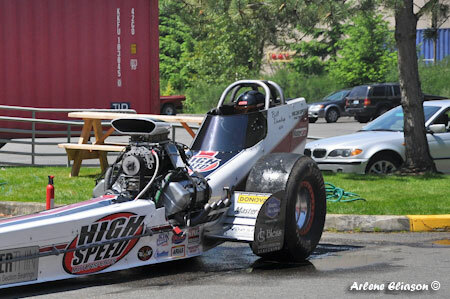 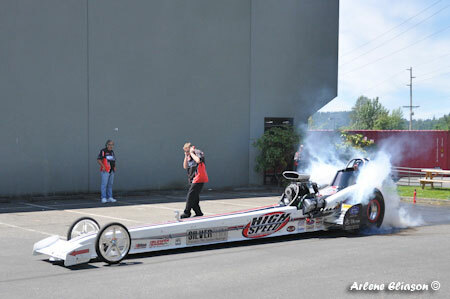 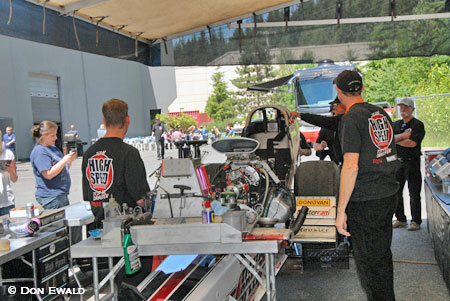 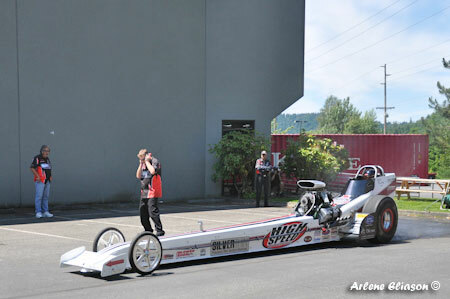 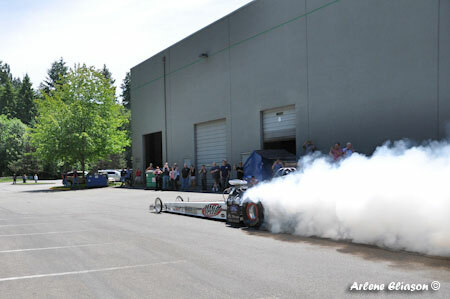 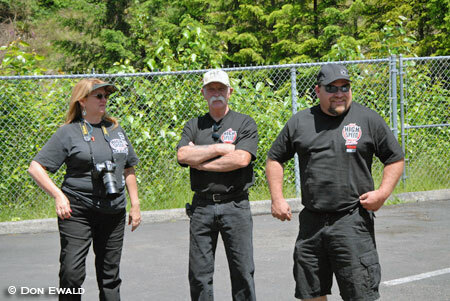 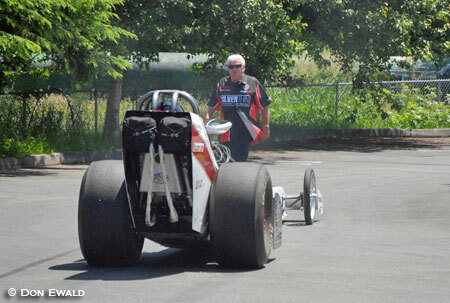 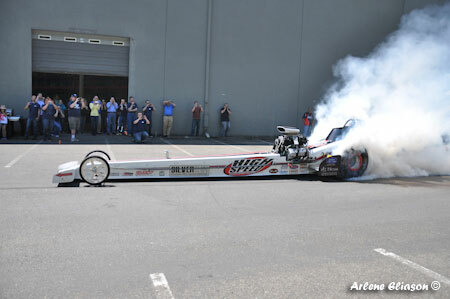 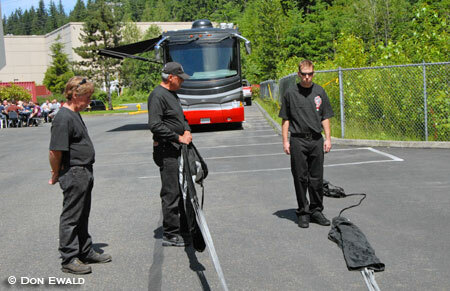 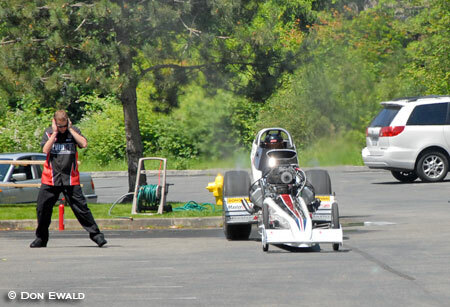 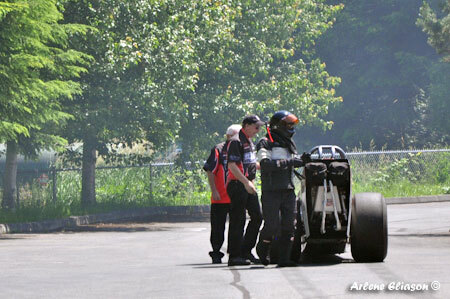 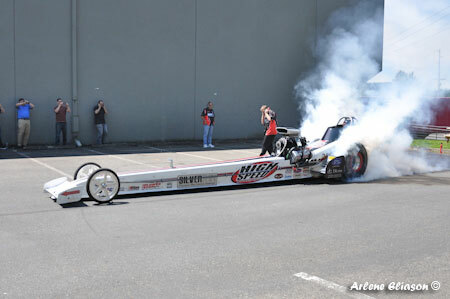 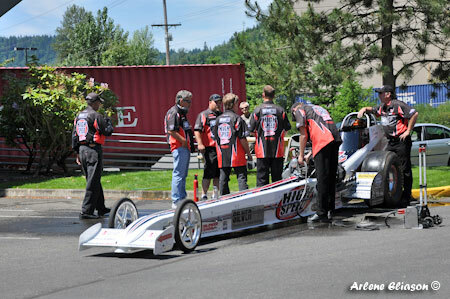 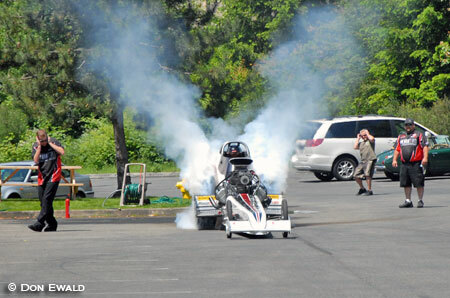 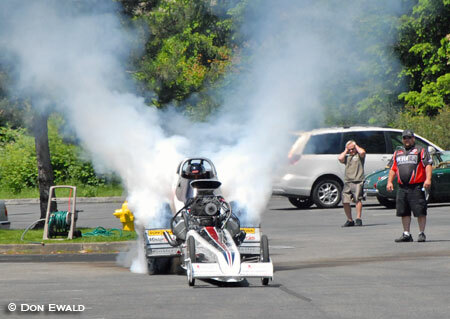 06-20-12 - Preston, WA: On Wednesday prior to the inaugural NHRA Hot Rod Heritage Racing Series event at Spokane, WA. 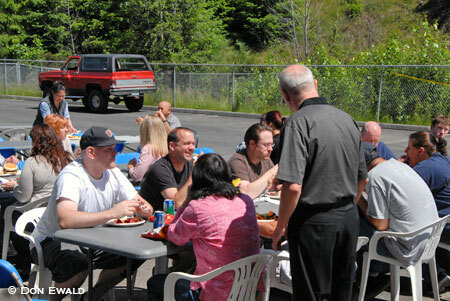 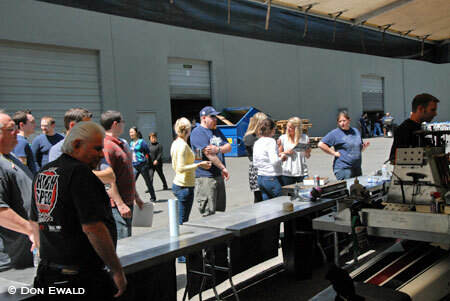 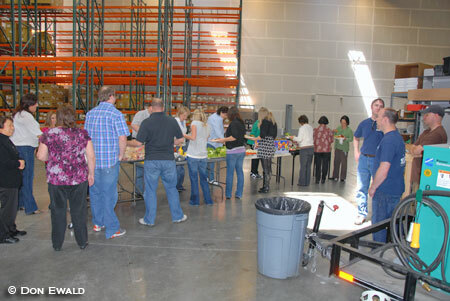 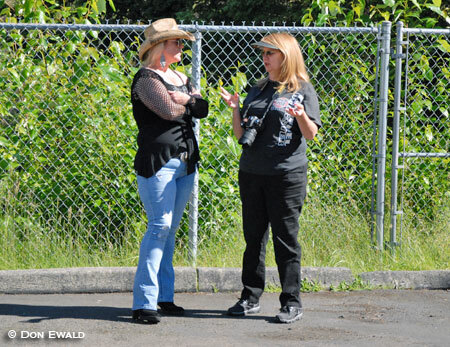 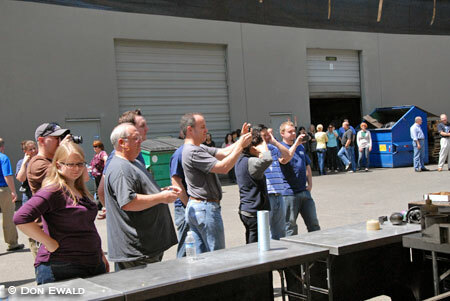 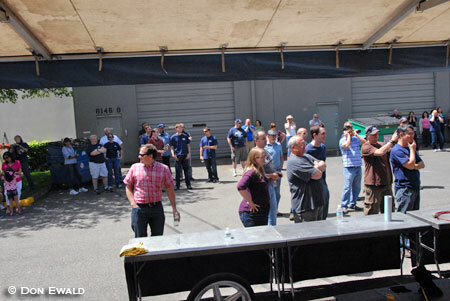 Mechatronics President, Kent Ross invited over one hundred business associates, special guests and employees to an open house complete with a sit-down BBQ at their main warehouse in Preston, WA. 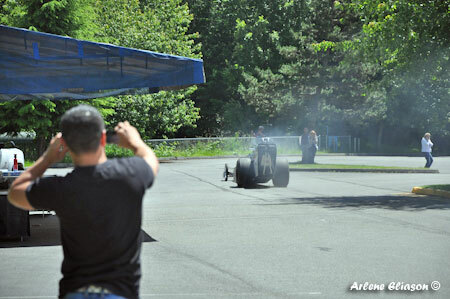 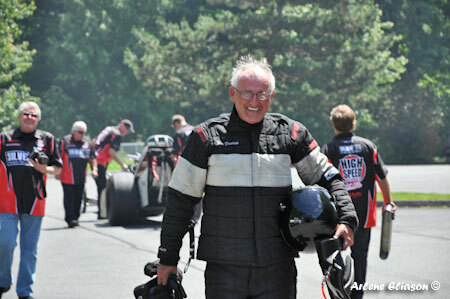 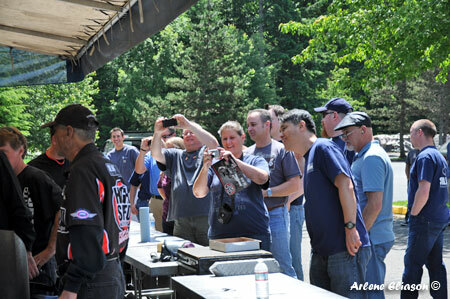 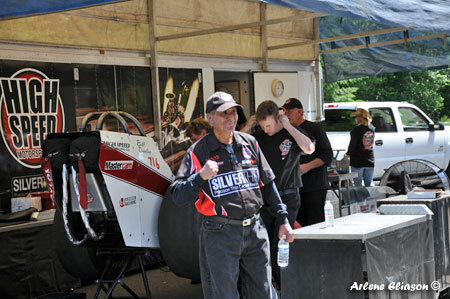 The highlight for the 7th consecutive year was an up close and personal look at the 3000 horsepower, 260 mph World Champion High Speed Motorsports Top Fuel Dragster that his company sponsors. 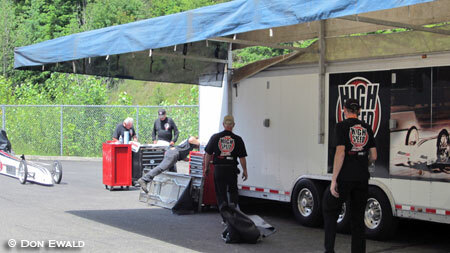 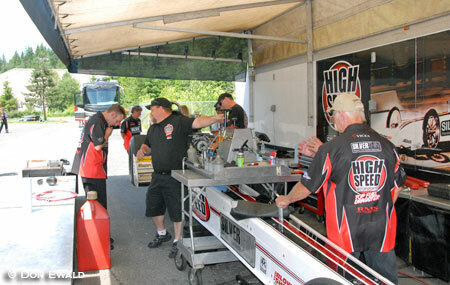 Arriving early, the High Speed Motorsports short crew unloaded the car and set up for a display in the back parking lot of the Mechatronics Operating Groups facility in rural Preston. 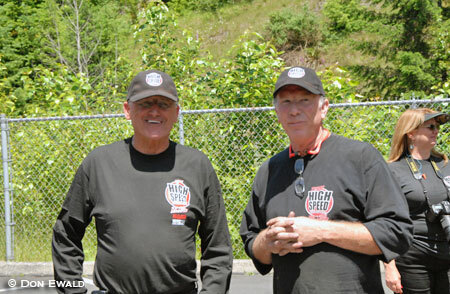 Representing HSMS were C.E.O. 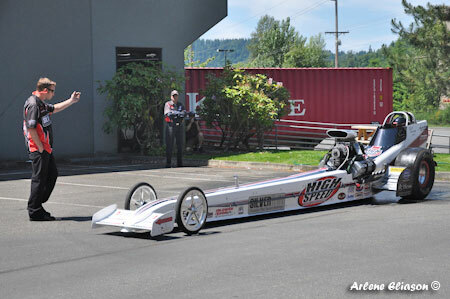 Dale Singh, C.O.O. 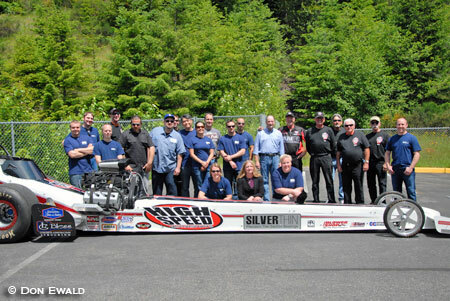 and Team Manager Tom Shelar, Walt Stevens, Rick Shelar, Sean Bellemeur, Chris Hedge, Arlene Eliason, Amelia Singh, Pete Palumbo, Rick McGee, Darrell Tedford, Don Ewald, Kristen Marsh and driver, Bill Dunlap. 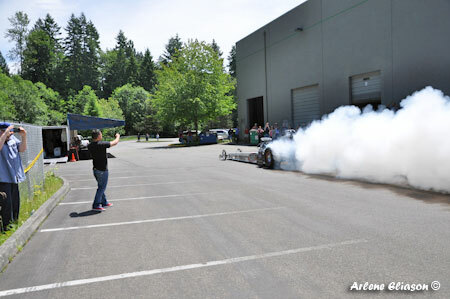 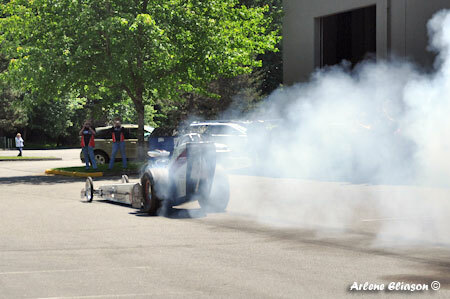 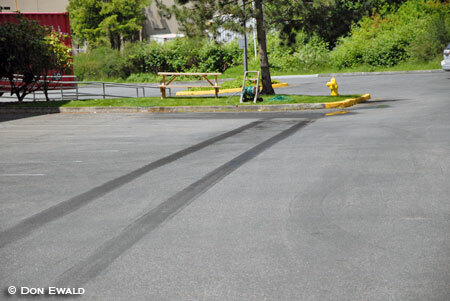 Under sunny skies, a good time was had by all and was punctuated by a full fledged burnout in the plant parking lot behind the plant. 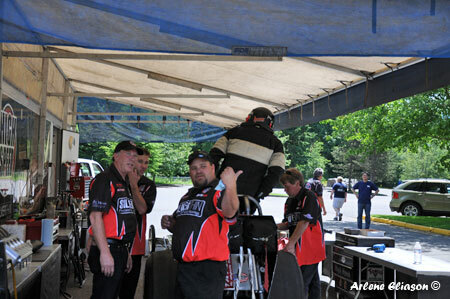 Here are a few photos from the day. 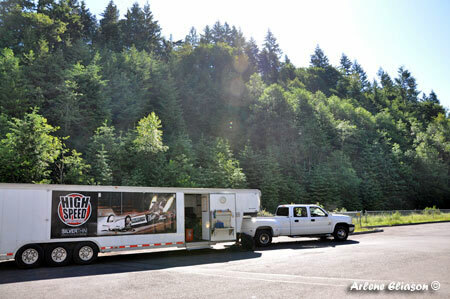 After driving up from Oregon on Tuesday, the team spent the night in Kent and made the short tow to Silverthin on Wednesday morning. 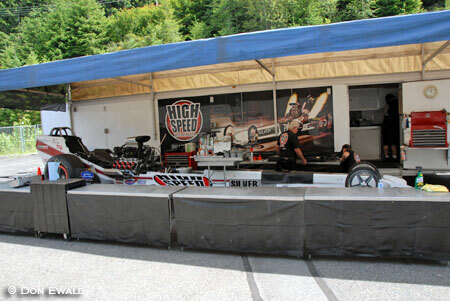 Expecting warm temperatures the awning went up. 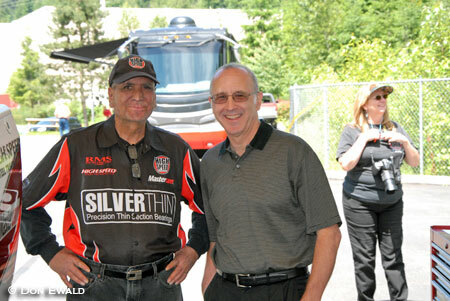 HSMS CEO Dale Singh's motorcoach is parked in the background. 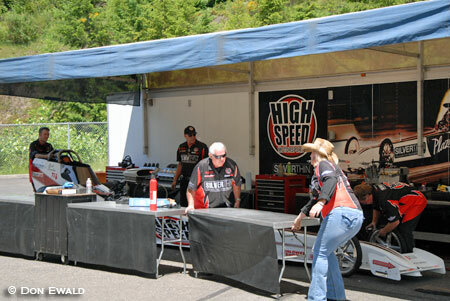 This was Kristen's first outing with the team and Arlene did a great job of getting her up to speed. 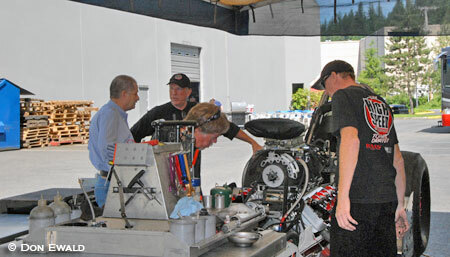 With the awning up, benches and tools in place, Kent Ross stopped by for a chat with Tom. 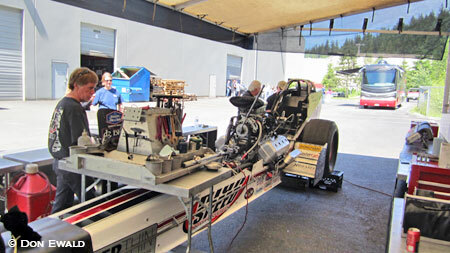 After the long tow from California, the car was examined for damage and then readied for a fire-up. 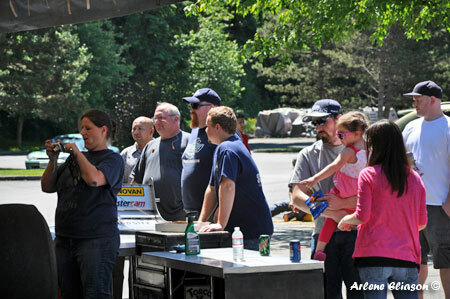 For the first time the BBQ was set up outdoors. 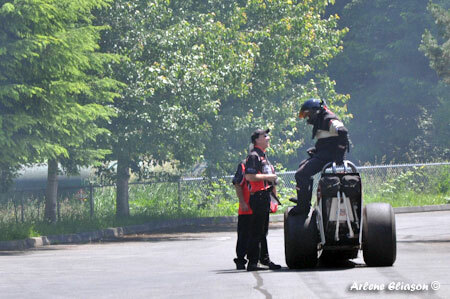 The weather was that nice. 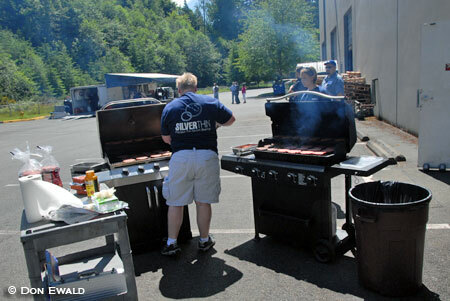 No shortage of hamburgers, hot dogs and amenities. 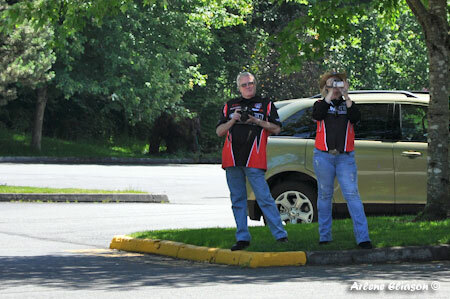 Darrell and Dale with Arlene, Kristen and Amelia in the background. 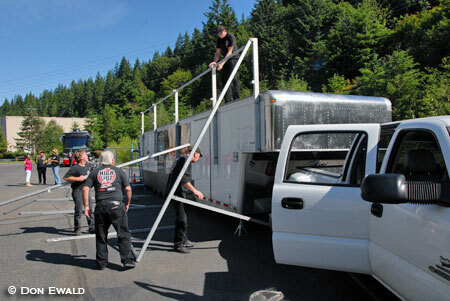 Bill, Chris and Sean packed the chutes. 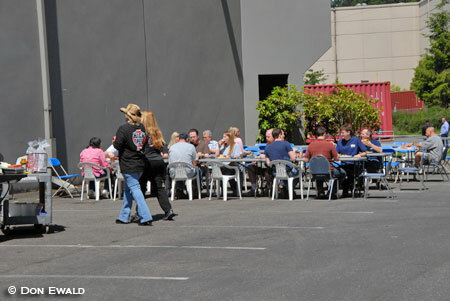 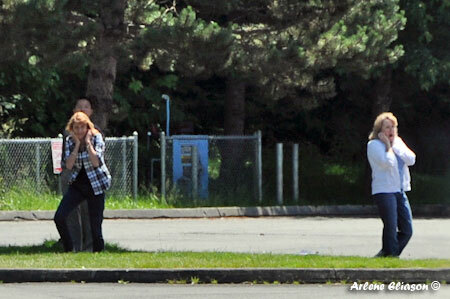 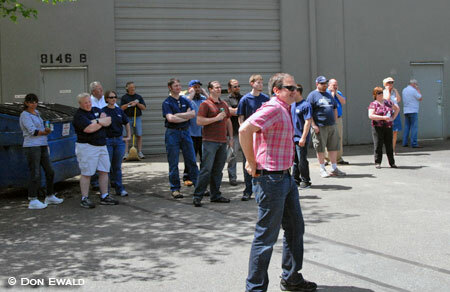 After they ate the quests and employees started to mingle around the car. 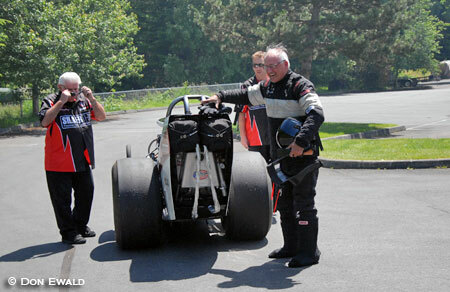 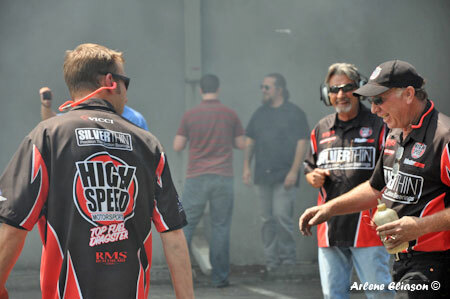 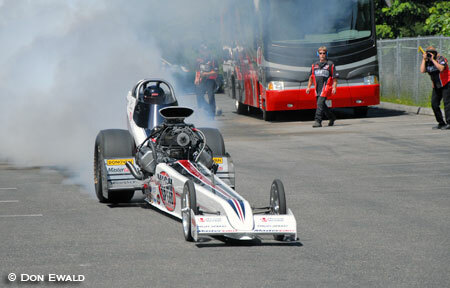 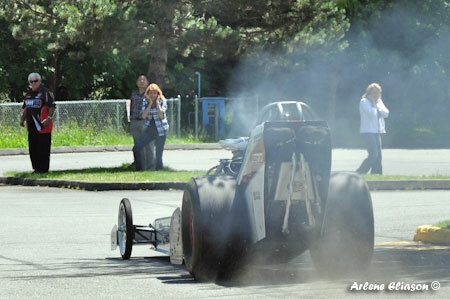 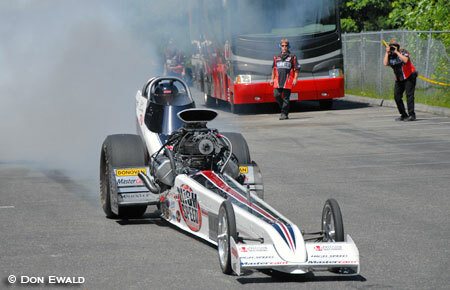 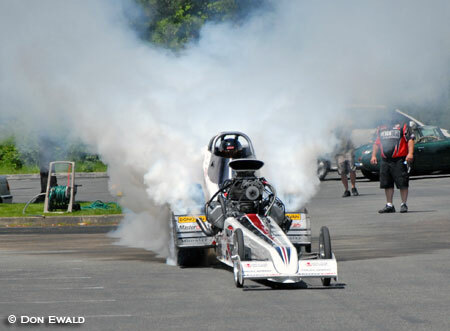 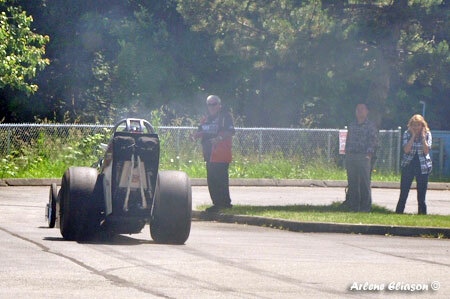 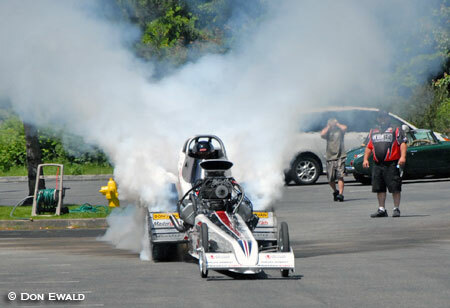 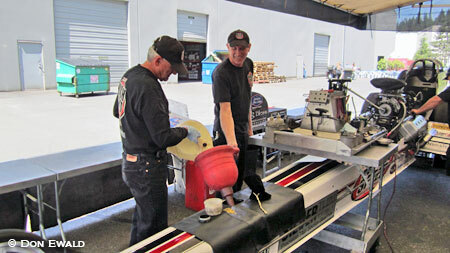 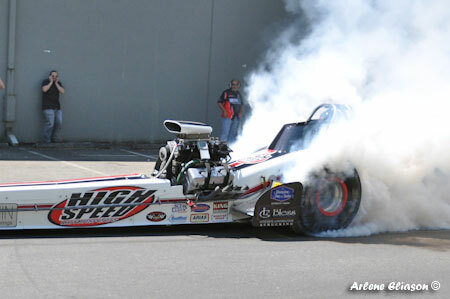 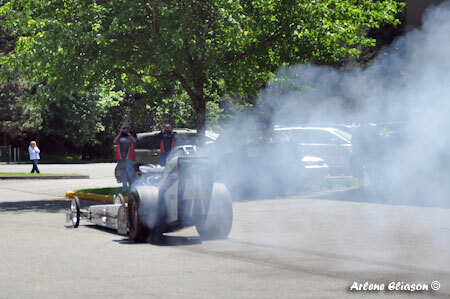 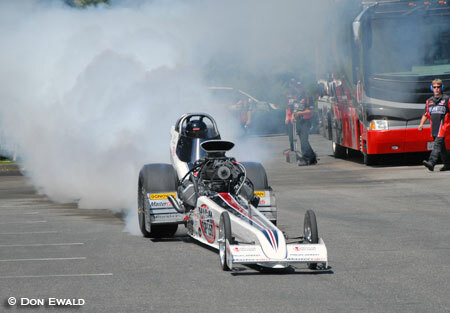 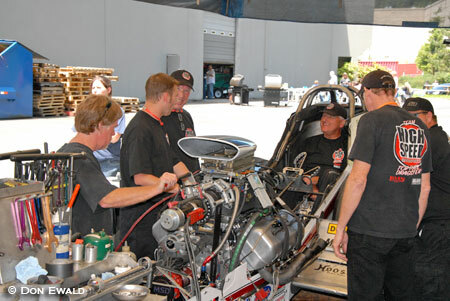 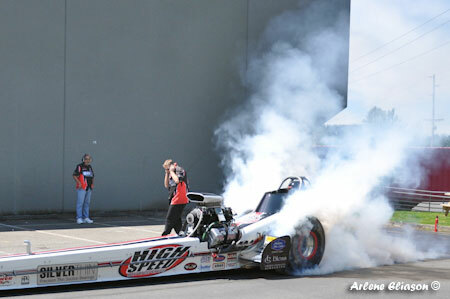 Before Tom took the seat for the nitro fire-up the car was started on alcohol to get some heat and set the timing. 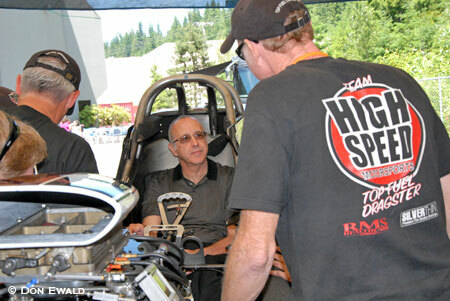 This year Tom White who is Chief Financial officer Mechatronics / SilverThin got the fire-up. 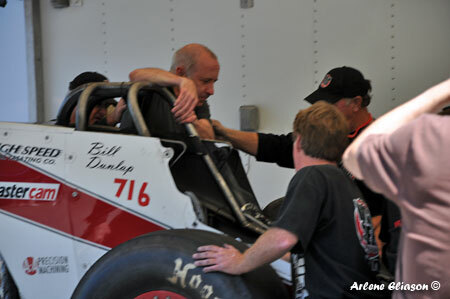 With Tom getting into the car for his fire-up, the folks got their photos before moving back when the engine was ready to start. 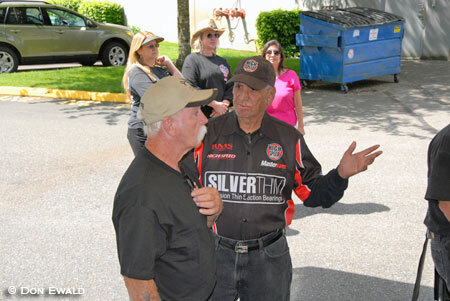 Bill explained what to expect and what needs to be done. 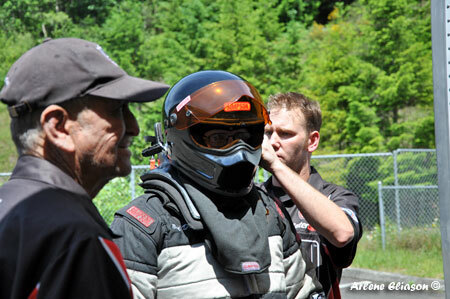 Due to the density of the nitro, special masks are worn enabling normal breathing and sight. 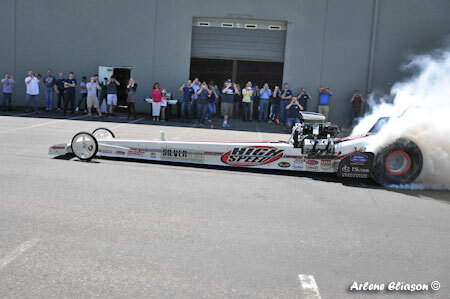 With ears ringing and to unmistakable aroma of nitromethane lingering in the air the folks from Silverthin realized they just experienced a rare thing. 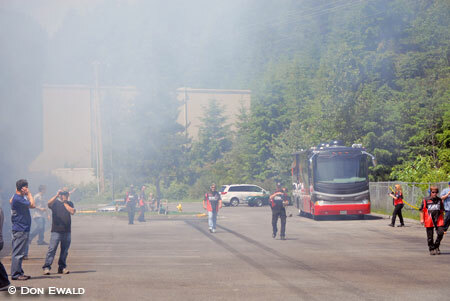 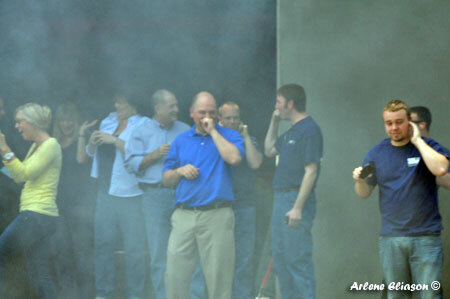 It took a while for all the smoke to clear. 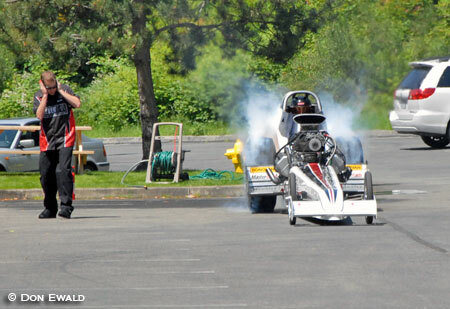 Ya think that was fun? 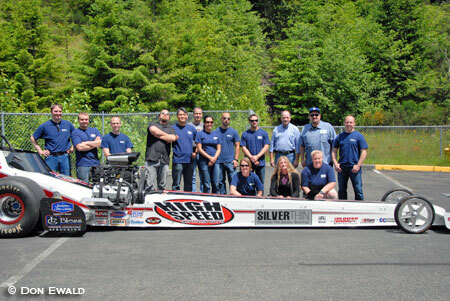 Some of the key employees at Silverthin. 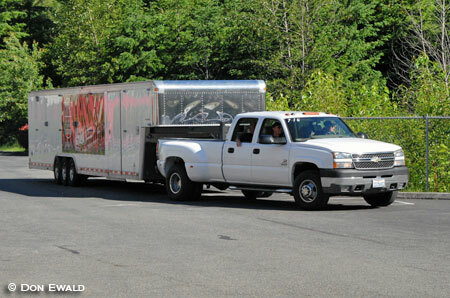 All that was left to load up and head east to Spokane. 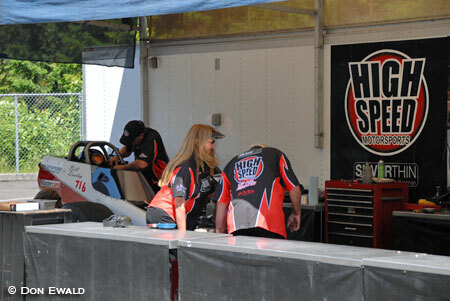 Thanks to Kent Ross and his staff from the entire HSMS team for another fun day in Washington. 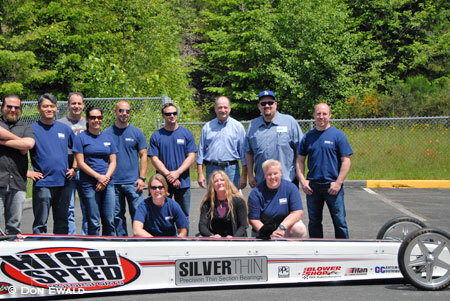 SilverThin Bearings is a division of MECHATRONICS CORPORATION, a privately held marketing, distribution, and manufacturing company that was founded in 1979 to market precision bearings to the aerospace industry. 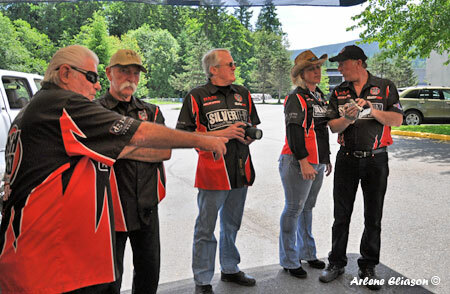 Today, the corporation is comprised of five operating groups that serve diverse markets. 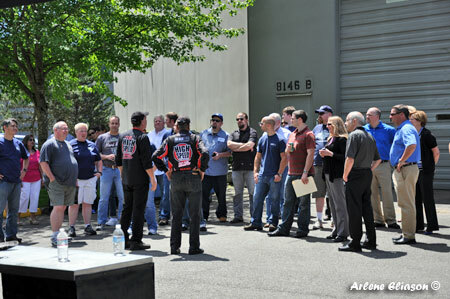 The SilverThin Bearing Group manufactures large diameter thin section ball bearings for the aerospace, industrial, robotics, and distributor markets. 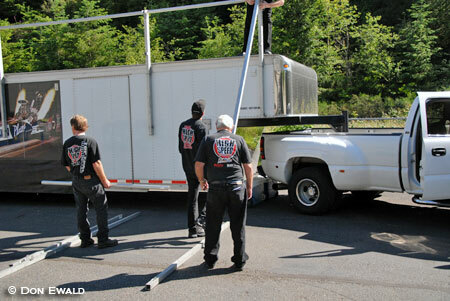 SilverThin bearings are manufactured in the United States in standard configurations, sealed and unsealed, up to 37 inches in diameter. 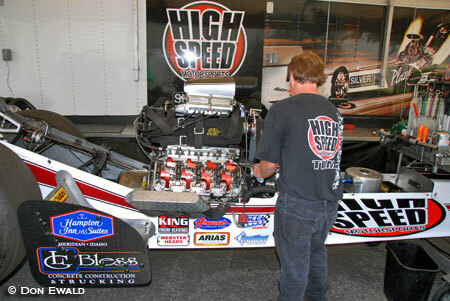 Standard bearings are stocked or in production to meet customer short lead time requirements. 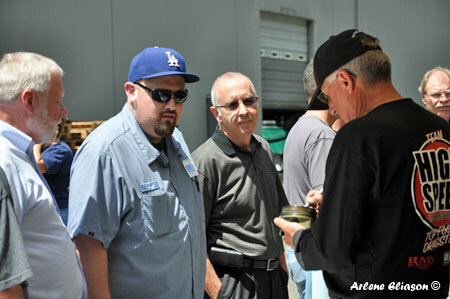 Special bearings are engineered and manufactured up to 37 inches in diameter, some from special materials, to serve the needs of our diverse customer base. 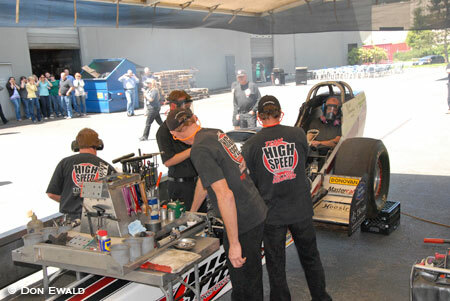 The National Precision Bearing Group distributes airframe control bearings, precision miniature ball bearings, and commercial industrial bearings to the computer peripheral , medical, dental, high technology, industrial, and aerospace markets. 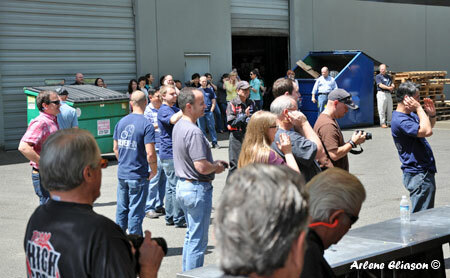 Headquarters for the Mechatronics Operating Groups is located in a 50,000 sq.ft. 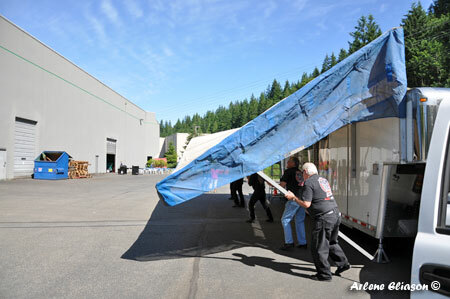 office and warehouse facility in Preston, Washington. 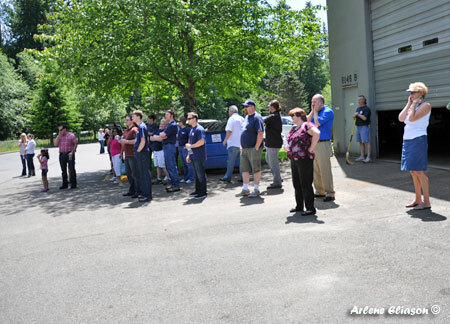 This facility contains a class 1000 clean room with bearing relubrication capability and supports value-added assembly operations with full lot traceability for all operations. 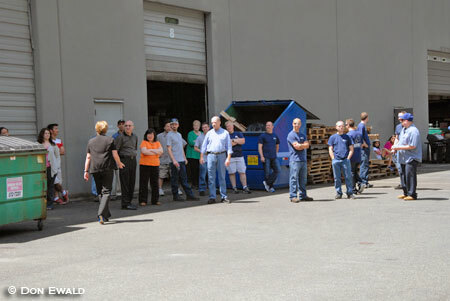 The facility has ISO 9001:2000 certification. 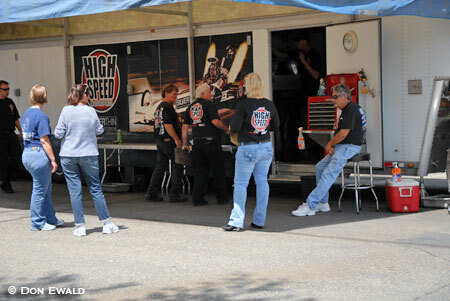 The corporation sells through its sales office, sales representatives and distributors in the United States and in various countries around the world. 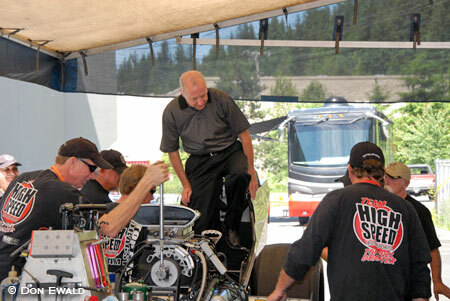 The operating group's websites will give you more specific information about the corporation's products and services.